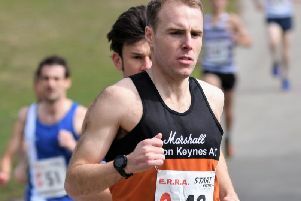 Lilli Stickley timed it almost perfectly, coming home just four seconds away from her prediction at the Wolverton Watchless five mile race last Thursday. Entrants estimate their time before the start, and are then compared to their final times when they cross the line. Lilli estimated a time of 42:09 and came home in 42:13. Chris Ryder placed second with a differential of 11-seconds whilst Jim Miller and Kevin Church finished equal third with a 12-seconds gap. The wooden spoon was awarded to Hazel Cockerill who had the biggest difference, 50:00 against 54:06. The race was part of the annual MMKAC Christmas Double, which coincided with the Christmas Kanter on Sunday. The field of 33 athletes are given a map and negotiate footpaths and bridleways on courses of 10km and 15km. From Westcroft they had to visit checkpoints in Howe Park Wood, Whaddon, Nash, Beachampton and Oakhill Wood. The Brent family (Martin, Debra and their son Alex) were quickest in the 10km recording 1hour 10mins whilst their was a close finish in the 15km. The team of Wendy Webber, Andrew Wasdell with Tim and Andy Inchley finished in 1hour 55mins just three minutes ahead of Dave Findel-Hawkins who ran solo in 1:58. Seven athletes completed both events: Dave Findel-Hawkins, Richard Inchley, Tim Inchley, Jim Miller, Alison Ray, Chris Ryder and Lilli Stickley.